Cardamom is probably one of my favorite spices. I absolutely love the smell of it, with its slightly hints or orange and I really, really wish that they would make it into a candle or even a Scentsy cube. But until then, I’ll just have to continue cooking with it to get that lovely aroma. 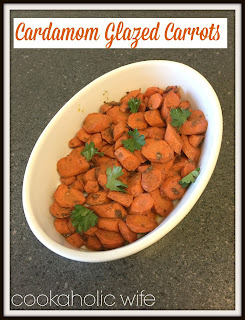 For years I never really liked the taste of cooked carrots and preferred to only eat them raw. In my attempts to find other side dishes that we like, I thought carrots could be a good starting point. Tom likes them most of the time and I just had to get over preferring them in their raw state. 1. Heat a medium skillet over medium heat. Add the butter and oil and swirl until butter has melted and coated the skillet. 2. Add the ginger and cardamom to the pan and cook for 2 minutes. Then add the water, brown sugar and carrots. Bring to a boil and cover with a lid. 3. 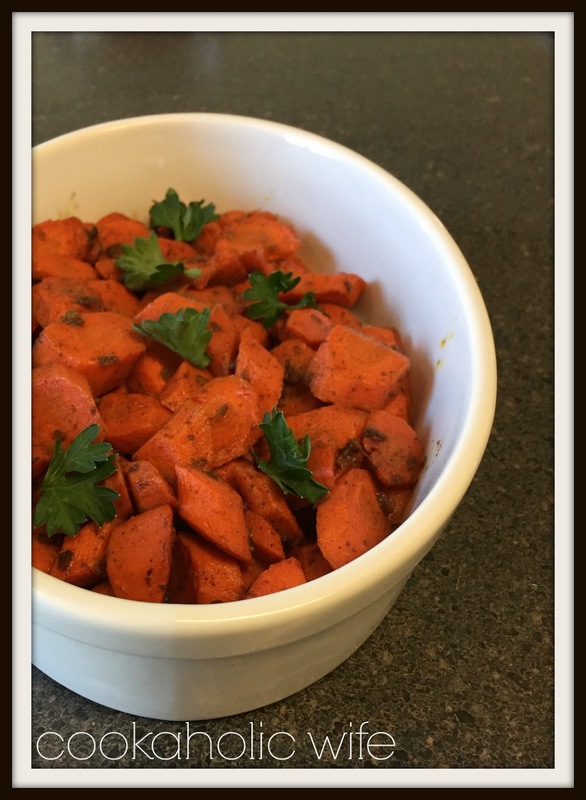 Cook for 10-12 minutes or until carrots are tender-crisp and liquid has boiled away. Remove the lid and divide among plates, seasoning to taste with additional salt and pepper if desired. Sprinkle with fresh parsley. I ended up making this recipe not in time with the rest of the meal. I prepared it on the stove first and then ended up warming it back up in the oven. The cardamom flavor was there, although mild and mixed perfectly with the sweetness of the carrots.